Featured is the unique Roadster bodied Miura, which was presented at the 1968 Brussels Motorshow. Bertone modified the coupe Miura considerably to form the Roadster. The most obvious changes are the revised front with an added grille and a lower windscreen. The rear end is also modified to showcase the transverse mounted V12 engine. Like a proper show car, the Miura Roadster was painted in an eye-catching metallic blue, which was complemented by an equally sparkling white interior. At the end of the year the unique Miura was sold to the International Lead Zinc Organization. Like Bertone and Lamborghini had done before them, the Lead Zinc Organization used the Roadster to show off their capabilities. They chrome and zinc plated most of the car and repainted it green. After being displayed in a museum in Boston, the car changed hands numerous times before being bought by the current owner late in 2006. He commissioned Gary Bolileff to completely restore the Miura Roadster. For the first time in almost forty years, the Bertone built one-off was able to show its true colours. The occasion was the 2008 Pebble Beach Concours d'Elegance where Lamborghini was one of the featured marques. 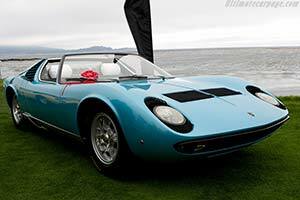 In the first twelve shots, the Miura Roadster is pictured at Pebble Beach after its complete restoration. Legendary Lamborghini test driver Valentino Balboni drove the car up the ramp to collect the second in class award. In the final six shots the car is shown during the 2006 Retromobile show, still sporting its International Lead Zinc Organization 'paint' scheme.